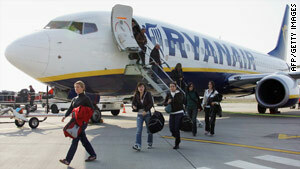 Ryanair says it is being unfairly singled out for criticism. LONDON, England (CNN) -- Ryanair on Monday rejected strong criticism from Britain's top business regulator, who accused Europe's largest airline of "puerile" tactics in the way it adds credit card fees on to advertised fares. John Fingleton, head of the UK's Office of Fair Trading watchdog, said the no-frills carrier was playing a "funny game" by imposing fees for anyone not using an obscure credit card. Fingleton, speaking to the UK's Independent newspaper, expressed dismay that the airline was able to advertise credit card fees as "optional" through its acceptance of a pre-paid MasterCard. "Ryanair has this funny game where they have found some low frequency payment mechanism and say: 'Well, because you can pay with that [the charge is optional]'," he said. "It's almost like taunting consumers and pointing out: 'Oh well, we know this is completely outside the spirit of the law, but we think it's within the narrow letter of the law'." Ryanair, which outlines its credit chard charges on its Web site, rejected Fingleton's comments, accusing the business regulator of trying to detract from its failure to tackle other issues facing the country's aviation industry. "Ryanair fails to understand why it was singled out for these inaccurate criticisms by Mr. Fingleton, when its charges policies are copied by high fare UK airlines," it said in a statement.